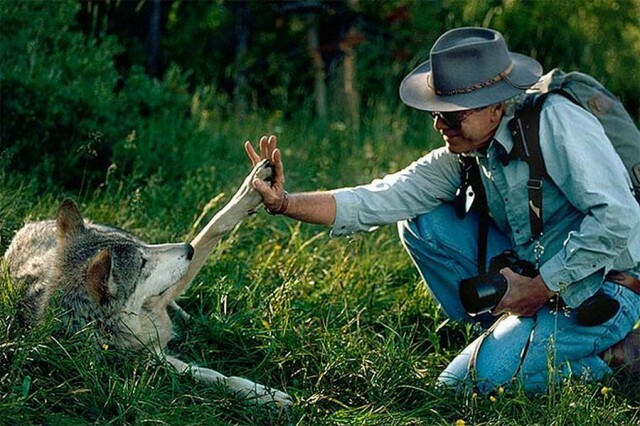 Jim Dutcher bonding with a wolf in the Sawtooth Mountains of Idaho, U.S. Jamie Dutcher. 1990-1995. Wolves are commonly misconceived within society. A wolf is often described as a vicious, savage, and emotionless beast that sole purpose is to terrorize all of humanity. They are constantly perceived as the villain in every narrative. However, this conception of the wolf is far from the truth. Above, you see a man. A man accompanied by one of the greatest forces of nature, the wolf. This image was captured within the Sawtooth Mountains of Idaho, U.S. The man holds in his left hand a camera and on his back a heavily congested backpack. The man’s attire includes: jeans, boots, collard long sleeve, hat, and sunglasses. As we can see, directly across from the kneeling man lye a wolf. The wolf’s fur is primarily gray with shades of black and white. The black fur is mixed with the gray fur along the wolf’s back, while the white fur rest along the wolf’s lower half of neck, chest, legs, and stomach. The man and the wolf are staring directly at each other. Both gazing each other in the eye, they are connected by the man’s right-hand and wolf’s left-front paw. From our observation we can conclude that this photo was possibly taken within the spring. The man is seen wearing spring clothing and sunglasses and wolf can be seen with a thin layer of fur. The man you see above is Jim Dutcher. Jim Dutcher is a filmmaker and cinematographer. The wolf you see is a gray wolf named Kamuitz. Jim Dutcher first received Kamuitz, along with a group of other gray wolves when they were just a few weeks old. Dutcher spent six years living amongst these wolves in their natural habit. He seen and recorded their interaction with each other and their development into a pack, The Sawtooth Pack. Kamuitz, the alpha member of the pack, displayed all the qualities of being a leader. Kamuitz was stern, strong, demanding, and adventurous from a very young age. Thus, all of these characteristics resulted in his leadership role of being alpha of the pack. He was indeed your generally description of the “vicious” wolf. Although, through years of spending time and earning the trust of the pack, Jim Dutcher was able to record a documentary of his time in the Sawtooth Mountains and his experiences with the pack. Accompanied by his wife, Jamie Dutcher, both were faced with many challenges and obstacles living in wilderness. The winters were harsh and the terrain was definitely not built for the likes of man. Through it all, they were able to capture this powerful image of man and the wolf. Jim and Jamie Dutcher built a bond and established a quality relationship with one of the most “savage” predators walking the face of the earth. They saw how wolves interacted and cared for one another through the structure of a pack, or better yet a family. Wolves indeed can be dangerous creatures; however, their true nature involves relationship amongst the pack and the love. Man and wolf are capable of living aside one another, as the connection can be vividly seen in the image above. Dutcher, Jamie. Wordless Tech. Living With Wolves. 10 Dec 2012. Housing in Trumbull Gardens apartment complex, Bridgeport CT. This image of Trumbull Gardens housing complex depicts the living arrangement of people in the inner city limits of Bridgeport Connecticut. From a visual standpoint it is not difficult to distinguish the difference between the inner city housing and housing in the suburbs. The quality of the living between these two different societies do not compare. It shows not only to the people who live in these places, but also to the world. This depiction of the inner city makes it seem as if this environment is unlivable. However, there are valid reasons given to why it may be that the inner city looks the way it does as represented in the picture. If you take the time to look at the image very closely you will understand that it has a lot of meaning behind it that has more meaning than most people may realize. In the image presented, it gives a visual representation of what some people tend to call the “hood” or the “ghetto.” What I see when I look at this image is home, but to others they may see it as a run down apartment building at first glance. 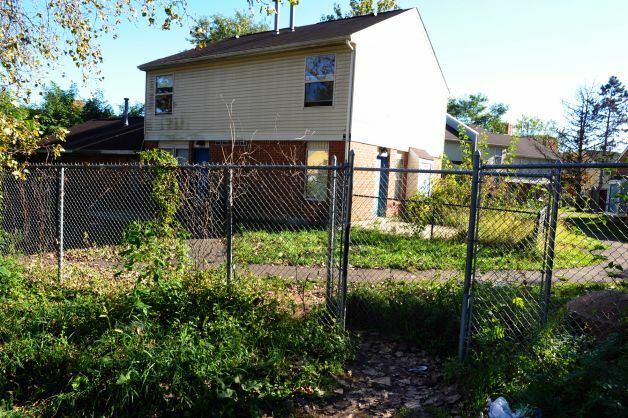 The visual area around the complex that you see in this image is an apartment building that is surrounded by overgrown vegetation and a broken fence that could be very hazardous to the individuals living in this community. The apartment building itself is extremely filthy with dirt and looks to be infested with mildew. When I look at this photo I see more than what the average person may. To me, this picture doesn’t represent the “hood” or “ghetto,” but this is the home of families who aren’t as fortunate as others. Although the apartment building may not be in the best of shape, it is still a place where a family lays their heads at night. The people living in these conditions can’t help how the outside appearance may look; that all depends on the government and what they decide to do. These unhealthy living conditions can all be changed if the government steps in and does something about this issue. These living conditions are not only affecting the appearance of the apartment complex, but believe it or not it’s also having an effect on the crime rate in this area. By this area’s poor security and easy access to the homes due to the broken fences, it allows the increase of robbery in this area. The crime rate is not caused by the people within this area, but mainly from people from other areas attracted to these housing complexes because these apartments seem to be easier targets for criminals and the terrible crimes they commit. Overall, some help from the government can change living environment of inner city Bridgeport as well as the crime rate for the best. This picture is a representation of change that must go in effect. The appearance shouldn’t define these places being labeled as a home, but the safety and comfort of these places by making these living environments better. In this image there are five red tomatoes that are all fully-grown and have no indication of any imperfections. Each of the tomatoes are attached to one another through green vines that are connected to the tomatoes on the top center of the fruit. The tomatoes do not look deformed in any way and look very healthy and edible. There are 12 syringes entering the tomatoes’ skin and the tips are deep into the meat. Each syringe has a tip that is grey, green or orange. There are eight grey, two green and two orange tips. The tips could identify which chemical is being injected into the tomatoes. The syringes are filled with a clear substance, most likely a drug or chemical. The syringes are all different widths and carry varying amounts of a chemical. 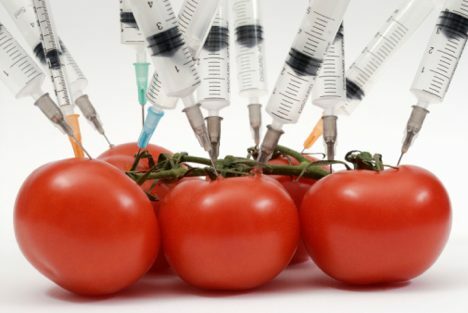 There is no source in the picture that would indicate who or what is holding the syringes in the tomatoes and if they are being injected. It looks as if they are being injected into the meat of the tomato because of the varying amounts of chemical clear liquid in the syringes. Even with the added chemical substance, the tomatoes look shiny and perfectly edible. The tomatoes are representative of a product that grows naturally in the world without a need for any genetic modification. The twelve syringes inserted represent the different chemicals added to a natural product to alter it’s DNA, forever changing the genetic makeup of that product. Since the tomatoes look perfectly normal even though unknown chemicals are being placed into them, it is possible that many genetically modified products will look completely normal and harmless to the human eye. If GMOs enter the market on a large scale, it will be difficult to recognize the differences between actual natural products and products that have undergone genetic alterations. Since the genetically modified products will look the same as the natural products, if not better, it will be difficult to know if you are consuming a product with chemicals or not. In this image does not show where the injections are coming from and what chemicals are inside the syringes. The lack of chemical identification and labeling will lead to potential allergens and diseases to consumers. It will be hard for the government to regulate what chemicals are being added to the product or to ensure that consumers understand what has been modified. David Gould’s image gives the person analyzing the picture the ability to recognize the deception of genetic alterations in a small scale example such as the tomatoes with syringes injecting unknown chemicals. The observations from this example can be related to all other natural products that undergo some genetic modification. Gould, David. “Genetically Modified Food Tomatoes Syringes Photo.” Digital Image. Sense & Sustainability: Fresh Perspectives on Sustainable Development. 14 May 2013. Web. 29 Oct. 2013. 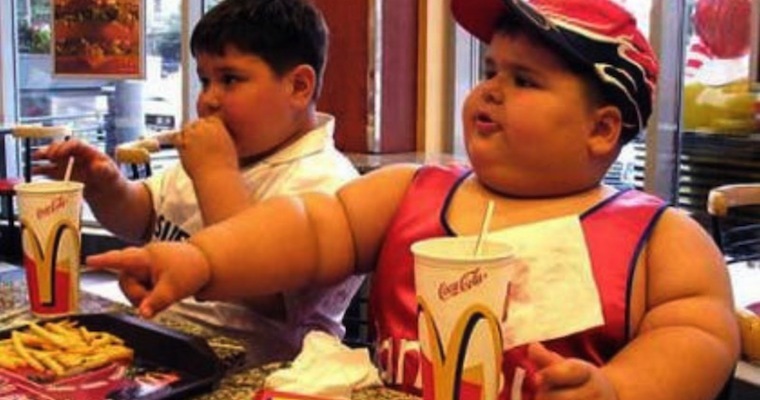 This photograph emphasizes the common stereotype that fast food is causing obesity in American children by displaying two young boys overweight eating McDonalds. There are two obese boys displayed in this photograph. They are eating McDonalds. The boy on the right appears to be capturing the most attention in the picture. He is wearing a shirt that reveals his body type. The shirt is low cut, and sleeveless, which shows the number of rolls on both his arms. The low cut sides of the shirt are showing the extra weight on his stomach because it is seeping through the sides. The napkin hanging over his shirt is greasy. The grease could have come from the large empty container of fries in front of him. The boy next to him is eating while trying to pick up his cup. The chances that the cup is filled with a very sugary drink is very likely, especially because McDonalds has a variety of sodas and juices that are self filled. This is allowing the boys to choose what they want to drink and whenever they want it. What they are most concerned about it eating all the food that is still left on the table. The two boys have very similar facial features and quiet possibly could be related. The brother to the right looks much older and slightly bigger. This is foreshadowing the younger boy in the future. Unfortunately, the older boy is being a very poor example of a role model. There have been numerous studies and lawsuits that have been published on people gaining weight or being diagnosed with a health issue due to the unhealthy amount of fast food consumed. This was very common pattern especially with McDonalds. Because of the previous experiences and research that has been done on the affect this type of food causes, it is not unusual the see these obese boys consuming this unhealthy food. This most likely was not their first time eating at this type of place. As many times as McDonalds will try and improve their menus or add healthier options, there will always be the generic food choices that will attract young boys. This type of food is the happy meals that come with toys and prizes. These meals are usually fried chicken and French fries that are filled with fat. Substituting fruit instead of fries is normally an additional fee some families cannot afford. These boys do not seem happy but it is clear they are enjoying their meals. The fries and burgers are tasteful, the boys are uneducated on the affects it is causing their bodies. Educating them in schools could help instill the significant harm fast food restraints are causing. The stereotype that fast food is causing obesity has been around for decades. In fact, fast food is causing and has caused people to become extremely overweight. It has always been known that fast food is unhealthy, but because of the low prices and accessibility, grabbing a quick meal has been the most realistic option for most families. Despite the fact fast food restraints are trying to improve the food they offer, the stereotype will continue to be prevalent in America because the obesity rate is only continuing to increase. Stefanik, P. “Caloric Intake in Relation to Energy Output of Obese and Non-Obese Adolescent Boys.” American Journal of Clinical Nutrition 7 (1995) 55-62. Electronic. <a rel=”license” href=”http://creativecommons.org/licenses/by-nc-nd/4.0/”><img alt=”Creative Commons License” style=”border-width:0″ src=”http://i.creativecommons.org/l/by-nc-nd/4.0/88×31.png&#8221; /></a><br />This work is licensed under a <a rel=”license” href=”http://creativecommons.org/licenses/by-nc-nd/4.0/”>Creative Commons Attribution-NonCommercial-NoDerivatives 4.0 International License</a>. 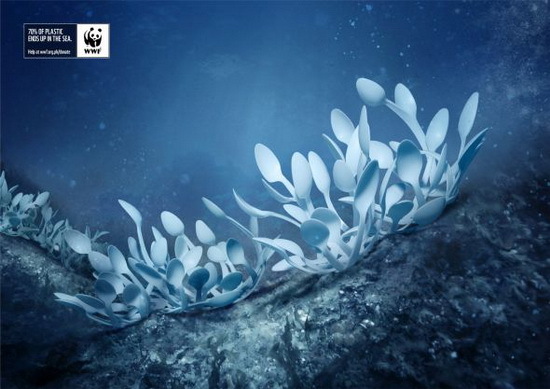 This image captures the horror of plastic spoons as a part of the deep sea ecosystem. This image features the harsh juxtaposition between the calm deep sea and the harsh plastic spoons that appear to be very out of place. This scene is shocking and anomalous to consumers of plastic and human manufacturing. The image seems senseless at first because certainly spoons cannot thrive underwater like the image suggests. But the spoons swaying with the ocean’s current brings light on the idea that over time, plastic waste will become part of the ocean’s ecosystems, which has the possibility of creating new life forms. The lighting specifically brings a person’s eye to the center of the image, where the spoons are placed. The dark glow surrounding the spoons illustrate not only the darkness of the deep sea, but the importance of this issue as highlighting it with the light from above. Spoons are literally part of the ecosystem in this image. If humans continue to waste and throw plastic into the ocean, then this image could become a reality. The image’s creator had the specific intent to raise awareness about waste being thrown into the ocean, which causes threats to thousands of species including humans themselves. WWF, the organization behind this awareness ad, is an organization that strives to inform the public about global issues such as pollution or preserving dying species. Part of the image is a display of their logo, which informs a person looking at this ad that they can contact WWF if he or she wanted to learn more. The small logo in the corner also includes the text, “20% of plastic ends up in the sea.” This is a shocking statement because it is a well-known fact that humans produce large amounts of plastic. Underwater creatures are forced to live in this unsanitary, plastic ecosystem. Plastic is poisonous to fish – hundreds of species die every year because of plastic waste. This becomes progressively more wrong when we take to mind we eat animals from these plastic environments, which can be detrimental to our health as well. The fact that 20% of that plastic is in the ocean is alarming in itself, but the image alongside the text adds more to the shocking effect. As plainly seen, the spoons are placed in this image deep within the sea. This is a metaphor to the unseen terrors that human’s create with waste; the plastic waste is hidden from the public awareness, in other words, at the bottom of the ocean. The waste that human’s created has been thrown into another species environment, completely destroying their world and yet forgotten in ours. The important message to take away from this image is to help the planet be waste free. The ocean is not our garbage truck, nor should it be a playground to human goods. The ocean is one of the few places left on earth left undisturbed by human’s wreckage – it would be in our best interest to preserve it and save if for the species that actually need it.